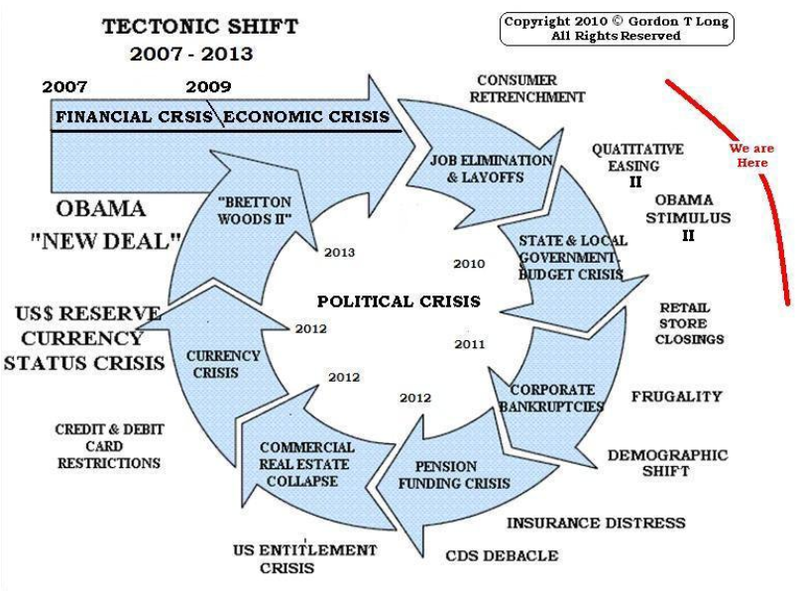 The following graphic provides an excellent visual as to how the crisis will unfold over the next few years. It will come in staggered stages, like continuous endless punches to the stomach, as our government will never allow insolvent or inefficient banks or companies to re-structure themselves into profitably and economically viable entities. I agree with the chart and its timeline completely. I see the commercial real estate collapse coming around 2012, just as the currency crisis is entering its final stage. The goal at that point will be to begin selling your gold and silver to purchase commercial real estate assets. I will be able to help readers and investors with the second portion of that process when the time comes. I am working extremely hard today to prepare for that future tomorrow. Until then, continue to accumulate precious metals and enjoy the show.